- Publisher Although the name of the book of Numbers derives from the lists and census data contained therein, Walter Riggans shows that this biblical book, rich in content, is best understood in the context of the Pentateuch as a whole. In this incisive commentary, the author describes the people of Israel during their trials in the wilderness, throughout the period of adjustment, and into the time of settlement. He illustrates that the underlying theme of Numbers is the gracious providence of the Lord, who cares for Israel in spite of constant rebellion by the people and their leaders. Book jacket. - Publisher Each Old Testament volume is divided into small study units that can be read and understood easily in only a few minutes a day. Written by respected Old Testament authors, each enlightening volume combines the most important results and fascinating insights of modern Old Testament scholarship with practical explanations and illustrations of the text's meaning. 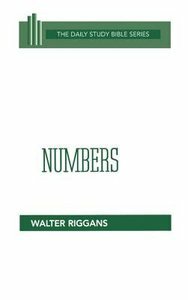 About "Numbers (Daily Study Bible Old Testament Series)"
Although the name of the book of Numbers derives from the lists and census data contained therein, Walter Riggans shows that this biblical book, rich in content, is best understood in the context of the Pentateuch as a whole. In this incisive commentary, the author describes the people of Israel during their trials in the wilderness, throughout the period of adjustment, and into the time of settlement. He illustrates that the underlying theme of Numbers is the gracious providence of the Lord, who cares for Israel in spite of constant rebellion by the people and their leaders. Book jacket. Each Old Testament volume is divided into small study units that can be read and understood easily in only a few minutes a day. Written by respected Old Testament authors, each enlightening volume combines the most important results and fascinating insights of modern Old Testament scholarship with practical explanations and illustrations of the text's meaning. Martin Noth, a most resourceful biblical historian, was a native of Dresden, Germany. On the completion of his studies at the Universities of Erlangen, Leipzig, and Rostock, he initiated his teaching career at the University of Griefswald (1927-30). Noth then taught Old Testament studies at the University of Konigsberg (1930-45) before moving to the University of Bonn, where he was Distinguished Professor of New Testament Exegesis and president of its evangelical theological seminary (1945-65). From 1965 until his death three years later, Noth was director of the Institute for the Study of the Holy Land in Jerusalem, a position once held by his teacher, Albrecht Alt. In addition to his pioneering tradition-critical work on the Pentateuch (A History of Pentateuchal Traditions, made available in English in 1972), Noth authored perceptive commentaries on the books of Exodus, Leviticus, and Numbers (whose English translations appeared in 1962, 1965, and 1968, respectively). Noth is mainly known to English-speaking readers through his classic, The History of Israel (1960). Though Noth's innovative historical reconstruction of pre-monarchical Israel as a tribal and cultic "amphictyony," an analogy to early Greek society, has suffered criticism in recent years, related ideas regarding ancient Israel's gradual settlement in the land of Canaan have proven useful. Moreover, many scholars have been influenced by Noth's theory that the book of Deuteronomy is no appendage to the Tetrateuch (Genesis--Numbers), but is instead the initial component of a large, complex literary work known as the Deuteronomistic History, which incorporates the Old Testament books of Joshua, Judges, 1-2 Samuel, and 1-2 Kings. This historical witness, says Noth, received its final editing in the sixth century B.C. after the dual monarchies of Israel and Judah had fallen to the enemy.